Keeping a website up to date can be a pretty time consuming business, even more so if you have to rely on others with technical know-how to do it for you. Taking control of your site with a content management system (often called a CMS) and updating your own website is not only good for your search engine rankings (they love fresh content) it also gives customers and clients a good reason to frequently revisit your site. This gives the website owner an opportunity to retarget visitors with new offers and incentives. In general the only software required to update a website via a content management system (CMS) is a web browser and an Internet connection. Once securely logged in users can make changes to their website on the fly in much the same way that they can access their Facebook or Hotmail accounts remotely. If you would like a content managed website that allows you to update pages and information yourself, please get in touch, I’d be happy to discuss your requirements. 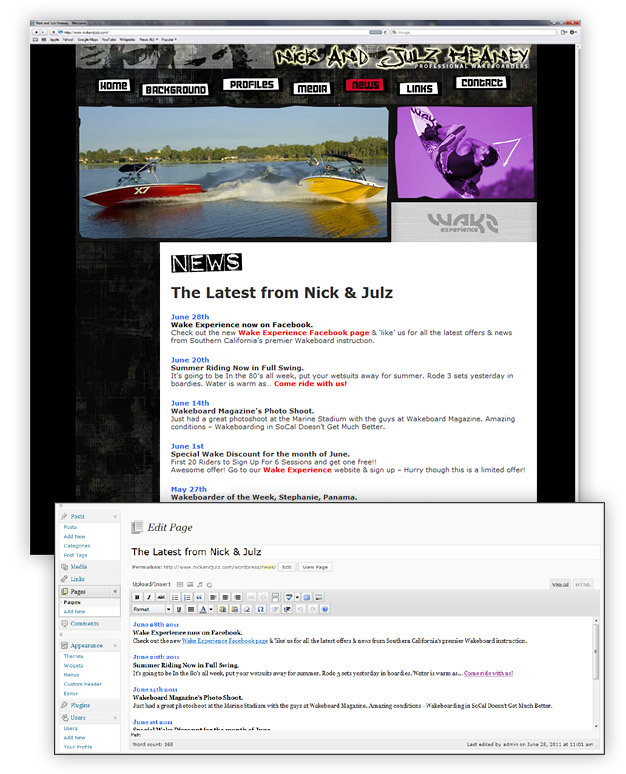 Please see examples of my content management (CMS) websites below. 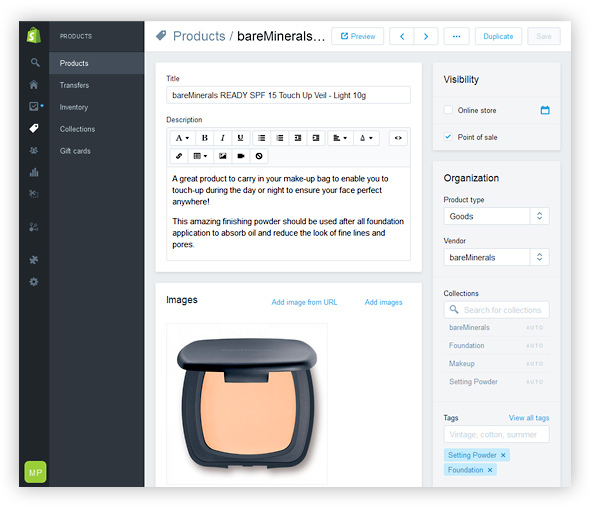 The Karma Beauty online shop is based on the e-commerce platform Shopify. 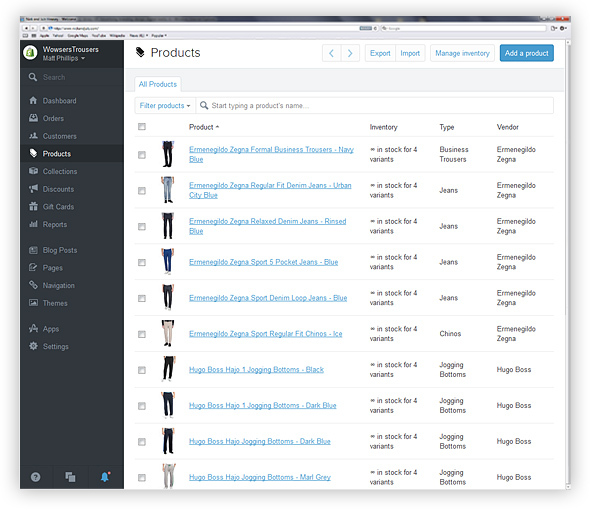 Shopify offers a fantastic content management system whereby the owners of online stores can log in for themselves and update and products as well as check and fulfill their latest orders. Click on the image above or here for further information about the Karma Beauty e-commerce website. Beverly wanted to be able to update the website herself so that information could be regularly kept up to date and accurate. I based the website on a content managed solution so she is able to easily and securely log in whenever she wants to update the website information. Click on the image above or here for further information about the Psychology Guernsey website. Click on the image above or here for further information about the La Villette Garage Guernsey website. 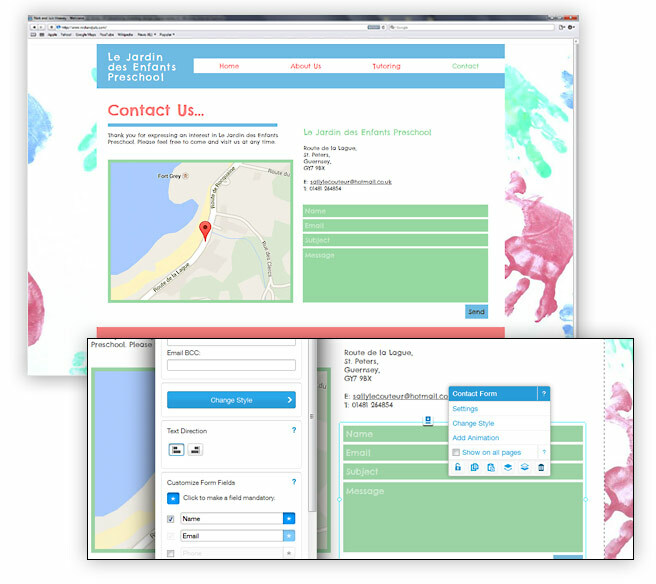 Click on the image above or here for further information about the Le Jardin Preschool Guernsey website. Click on the image above or here for further information about the Wowsers Trousers e-commerce website. 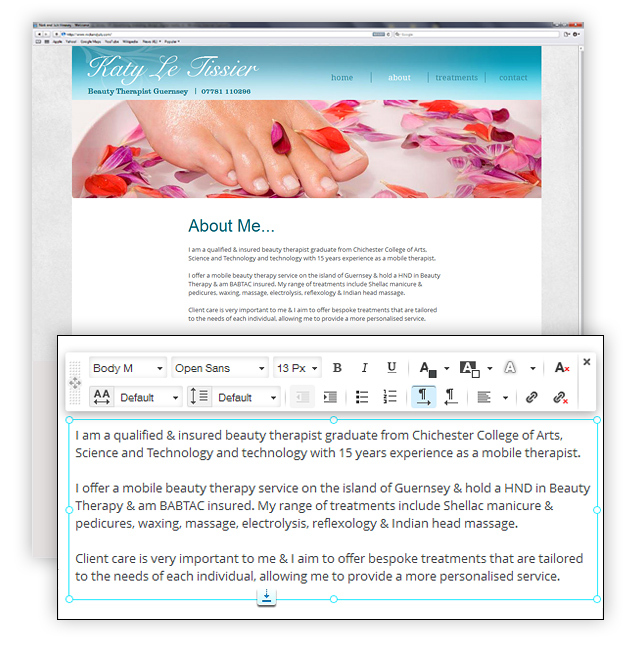 Click on the image above or here for further information about the Mobile Beauty Therapy Guernsey website. Click on the image above or here for further information about the Green Acorn website. Nikki wanted to be able to update her website frequently with news of events and useful information. With her having no experience of updating website content, I utilised a Content Management System which meant that she is able to simply login to the site and update text, links and images whenever it’s necessary, as well as creating additional pages and menu items. 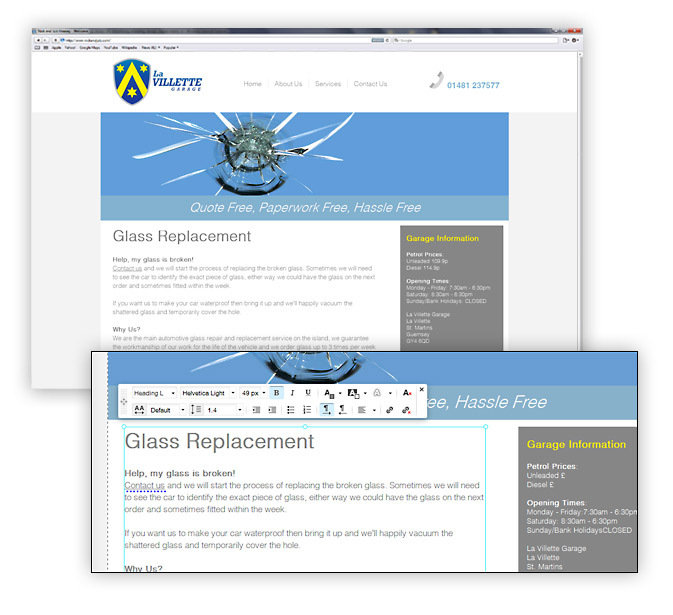 Any additional, new pages or content will automatically follow the website design template that I created. 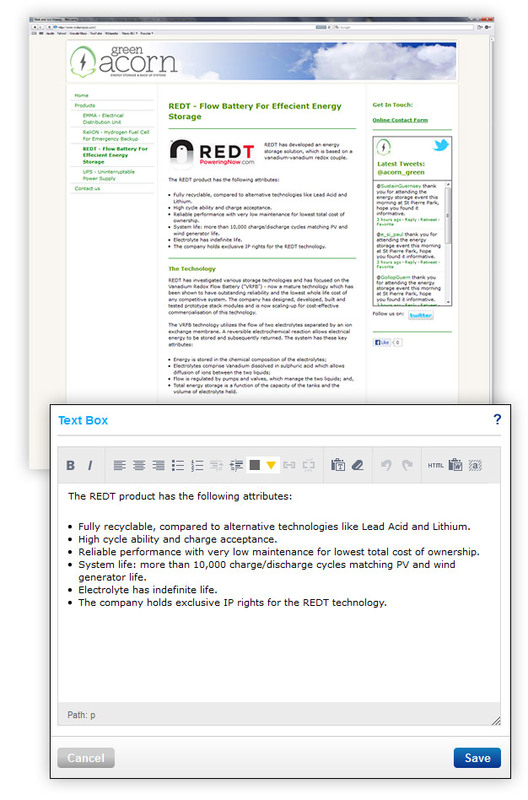 The user friendly CMS means that updating the website is as straight forward as editing a Microsoft Word document, as can be seen in the screenshot above. 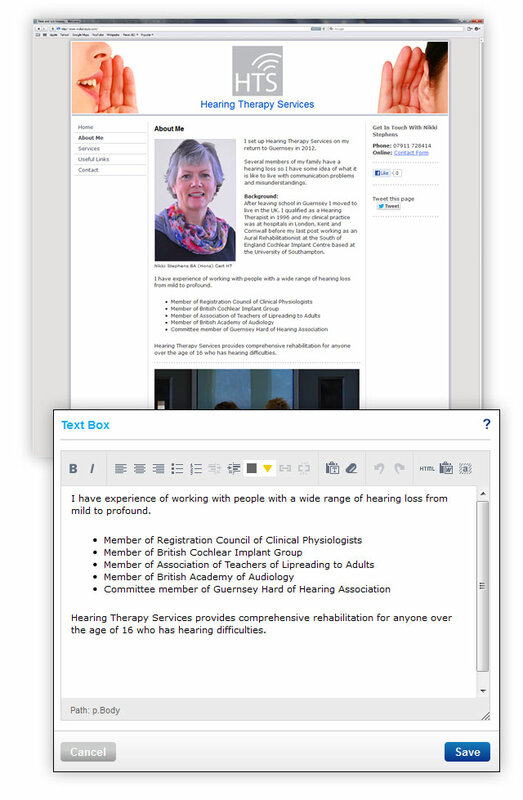 Click on the image above or here for further information about the Hearing Therapy Services website. Nick and Julz wanted to have a page on their website where they could update all of their latest news. Having no experience at updating websites themselves or any knowledge of html coding I created a basic CMS for them using WordPress. This means that via a secure online log-in Nick and Julz are able to update content on their website. 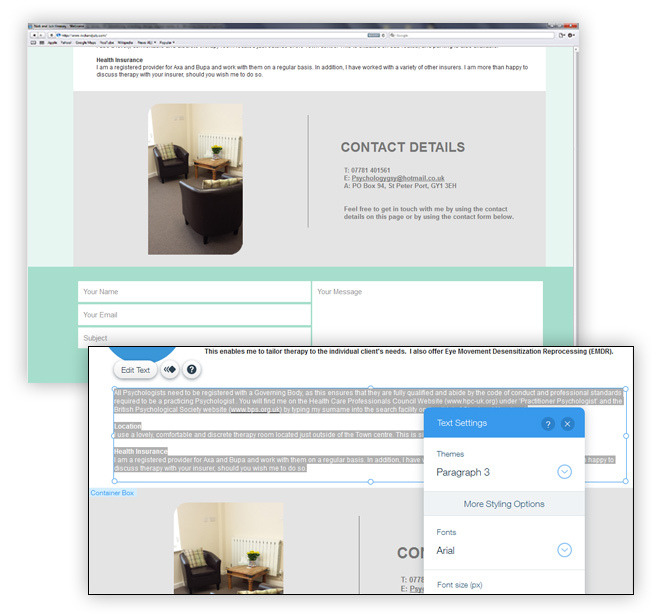 As illustrated in the screenshot above the user friendly CMS allows them to type and format text, create links and add images with no more technical knowledge than it takes to write an email. 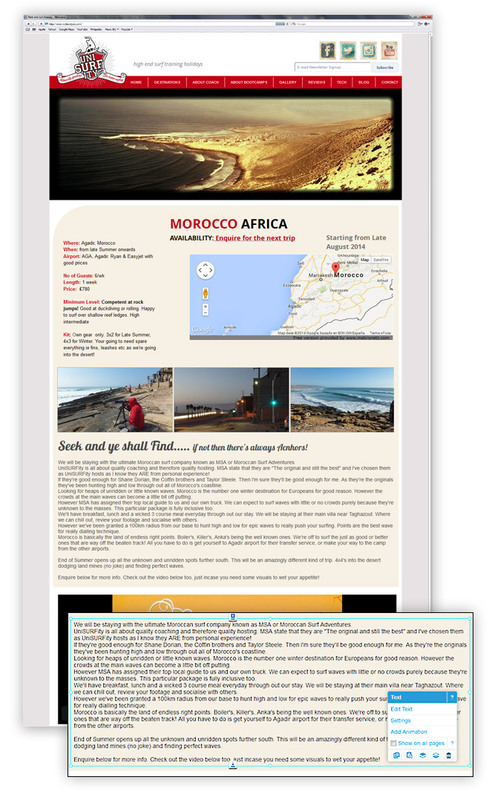 Click on the image above or here for further information about the Nick & Julz website. If you would like a content management system (CMS) website that allows you to update pages and information yourself, please get in touch, I’d be happy to discuss your requirements.